Under the state JFM benefit-sharing mechanism for degraded forest, the village should have got half the net revenue. “It happened because there was no clarity in the (forest department’s) working plan about what will be the benefit-sharing pattern in JFM areas where paper mills have also been allocated bamboo,” says Thakarse Dawra, project specialist, forestry, with Agha Khan Rural Support Programme in Bharuch district. The forest department has taken note of this, says Sashi Kumar, the district forest officer at Rajpipla, east division. The village has decided not to participate in JFM ever. In Sabarkantha district, residents of Vejpur village have abandoned the forest they protected for 17 years. “We used to sit in a group of eight-ten every night to watch over the forest,” says 65-year-old Ramjibhai Khumaji, former army officer who took lead in forest protection under JFM. Years of protection raised a dense forest. “The forest department promised us 50 per cent share in the profit but we have not got anything yet,” says Asari Kavji Bhai Saroji, acting president of the Tree Growers Cooperative Society recognised as the JFM committee. Prakash Rawal, district forest officer, Sabarkantha South, has a different story to tell. “Many forests under JFM are ready for harvesting but people ask for 50 per cent share in gross profit. This is not possible under current JFM rules,” he says. Until that is cleared, no harvesting can be done. Absence of working plans is another reason harvesting is held up. Such plans should have been prepared along with the communities. In case of dense forest Gujarat has a novel approach. Of the net revenue it sets aside 20 per cent for traditional tree cutters united under a federation and gives 20 per cent of the remaining 80 per cent, that is 16 per cent of the net revenue, to JFM committees in kind, not cash. The aim is to use the JFM benefits to strengthen livelihood options. For example in Dangs, a densely forested district, JFM has been linked to animal husbandry and agriculture. “The problem of forestry is actually poverty. Until this is addressed, real empowerment of people is difficult,” says C N Pandey, chief conservator of forests, Gujarat. 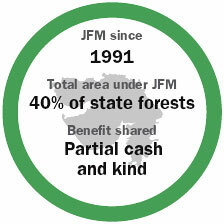 By 2008 a little over Rs 500 lakh of net profit had been generated in North Dangs through harvesting of JFM forests. Of this over Rs 80 lakh has been shared with communities. Given that 684 families are engaged in JFM in North Dangs, per family share is Rs 11,725. In Borkhal village in South Dangs the share of each family comes to Rs 10,189. The forest department offered two options to the residents to redeem their share in benefits. They can either buy a cow or level land for farming. The department subsidises a cow, costing between Rs 21,000 and Rs 25,000, by Rs 10,000. A total of 54 cows have thus been bought in the two villages in March-April this year. Data available with residents shows that each family earned Rs 854 to Rs 1,200 a month from selling milk. It is a good addition to their income, especially in a place like Dangs where people migrate for just Rs 10,000. At least selling cow’s milk gives them a sustained income, says Pradeep Singh, divisional forest officer, Dangs, South Zone. Those who opted for land levelling hire a tractor. It costs Rs 400 for an hour. “The terrain in Dangs is undulating. Land levelling will help generate sustained income to villagers,” said Munav Sheikh, range forest officer, Ahwa East in Dangs. Similar experiment has been done in Rajpipla east division where the forest department gives subsidy for drip irrigation under JFM. Not only in Gujarat, tribal people all over India want a greater share in the profits accruing from forests. The Gujarat govt's approach is sensible I feel---to give something solid to the tribal families for a sustainable income instead of just hard cash. If the tribals had been given just hard cash it would have been spent by the men in no time, on booze and toys---motorcycles, mobiles, and other gizmos, leaving the women to feed the family for the rest of the year! At least with the current practice of subsidizing the purchase of a cow or levelling land for agriculture, the tribal family is assured of some food throughout the year. 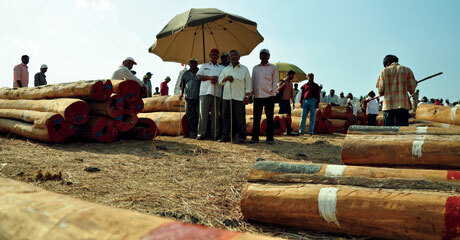 Tribals have been given a share in the sales from the timber in Gujarat but they are demanding 50% of the profits today. Tomorrow they may start demanding 70-80% of the profits. Even if the govt. conceded to their demands I doubt whether it will pull them above the poverty line unless and until their mindset changes. The concept of "saving" is alien to them and in former times it was not necessary as Nature was abundant and the dense forest provided for most of their needs. But present times are different. Forest cover has been reduced drastically and in order to earn a livelihood some interaction with urban and rural communities is essential for these tribals. To ensure food security they must imbibe and practice the concept of "saving". Unless they do this, there is little hope of their betterment no matter how good the govt. schemes are. In practical terms it means that their menfolk must reduce their excessive boozing and merrymaking and that they must utilize the banks and post offices to save their earnings. At the same time they must be careful not to be allured by the toys and trappings of the urban lifestyle, because they have little relevance in a forest. Even Emperor Ashoka warned the forest dwellers in his empire to behave themselves and not overstep their boundaries in his famous stone edicts, otherwise there would be reprisal from the side of the state. This speaks volumes about the roe of these tribal groups in any state economy and polity in India. Let them retain their unique customs and lifestyle, but not be an irritant to the state.